[ Dame Adelaide Anderson, civil servant and campaigner against child labour. ] Typed Letter in the third person, with addition in autograph, to the Secretary, Royal Society of Arts, regarding a lecture by Laurence Binyon. On letterhead of 36 Gloucester Court, Kew Road, Kew, Surrey. 8 November 1930. 1p., 12mo. In good condition, on lightly-aged paper. Docketed in manuscript above text of letter. The typed portion reads: 'Dame Adelaide Anderson presents her compliments and is very glad to receive the card of invitation to the Lecture by Laurence Binyon LL.D. on Persian Painting, to which she looks forward to [sic] on Wednesday, 19th November, at 8.30 p.m.' Autograph addition: 'Her address is now as above (not as hitherton, 21 Allen House, Allen Street, Kensington)'. [ Sir James Allen, New Zealand politician. ] Autograph Signature ('J Allen.'). On 3 x 8 cm. slip of paper, cut from letter. In fair condition, lightly aged, laid down on piece of green card. Good firm signature, cut from a letter, beneath the typewritten words 'Yours faithfully,' The card is erroneously annotated in a contemporary hand 'Sir J. Allen | Prime Minister of New Zealand'. [ Sir Frederick Augustus Abel, chemist. ] Manuscript note, signed by Abel ('F. A. Abel') to Sir Walter Buller. On letterhead of the Imperial Institute of the United Kingdom, the Colonies and India, London. 19 December 1893. 1p., 12mo. In good condition, laid down on leaf removed from album. The note reads: 'The form of receipt is in the printers' hands. Addressed to Buller at the South Kensington Hotel. [ Bruce Stewart, actor and scriptwriter.] Typescript of 'Afternoon Theatre' BBC Radio 4 play about John Henry Newman and Edward Bouverie Pusey. With covering BBC postcard and compliments slip, and copy of Radio Times entry. [ BBC Bristol. ] Broadcast on BBC Radio 4 on 5 May 1979. The duplicated typescript of the play is 79pp., folio, on 79 leaves attached with a stud. Aged and worn, with slight staining to early leaves. Accompanied by a BBC compliments slip, with the typed name of the play's producer Shaun MacLoughlin. Also present is a BBC postcard, with short typed message dated 26 July 1979: 'We are sorry but there is nothing in print for the play "Shadowfall".' A carbon copy of the typed letter from Mrs. D. G.
[The Royal New Zealand Armoured Corps (RNZAC).] 'Restricted' information document, duplicated typescript with illustrations. Communications Wing, School of Armour, Army Training Group, Waiouru [New Zealand]. 2 November 1975. 6pp., 8vo. On three leaves stapled together, with punch holes for ring binder. In good condition, on lightly-aged paper. With 'RESTRICTED' at head and foot of each page. Corps badge at head of first page and six illustrations in text. Divided into 24 sections, with headings: Formation; Early History; The First World War; The Second World War; Post War; Alliances; The Badge; Corps Colours; Dress Distinctions; Corps Day; Official Music; Patron Saint; Corps Motto. Written in a no-nonsense style. For example, the final two sections read: 'Patron Saint | 23. [David Boyle, Earl of Glasgow, Governor of New Zealand, and Sir John McKenzie, Minister of Lands.] Document signed by 'Glasgow', appointing Frederick Pirani to the Wellington Land Board; filled in and signed by witness 'John Mc.Kenzie'. [Wellington, New Zealand.] 17 January 1895. 1p., foolscap 8vo. In fair condition, on aged paper, with minor repair to reverse. A printed document, completed in McKenzie's autograph and signed by him, with the signature of 'Glasgow' at the head. Note: Frederick Pirani was appointed acting professor of mathematics at Melbourne University in 1874, and in 1893, he was elected to the New Zealand parliament." Typed Letter Signed ('Cobham') from Lord Cobham to Sir Harry Luke, concerning Queen Salote and arrangements at Govt Hse New Zealand. 24 December 1957; on letterhead of Government House, Wellington, New Zealand. 4to, 1 p. Nineteen lines. Text clear and complete. Good, on lightly-aged paper. Thanking him for 'the two charming letters' which Luke wrote to Cobham and his wife. 'It is always a great encouragement when one is in a new and unfamiliar job to receive a pat on the back from someone who has been in the game all his life.' Cobham's 'loud and noisy family' make Government House 'a bit of a family home', but he will try and 'stiffen it up for State functions, receptions, etc. although noises are still apt to drift down from the upper quarters'. [Printed British parliamentary report.] Australasia. Correspondence relating to the Naval Defence of Australia and New Zealand. Presented to both Houses of Parliament by Command of His Majesty, October, 1908. London: Printed for His Majesty's Stationery Office, by Darling & Son, Ltd, London. 1908. Folio, iv + 56 pp. Stitched. In original blue printed wraps. Text clear and complete. Internally good, on lightly-aged high-acidity paper. Wraps worn and a little chipped, with a few closed tears. Wraps carrying Hull University withdrawal stamps. [Printed British parliamentary paper.] Report from the Select Committee on Colonisation; together with the Proceedings of the Committee, Minutes of Evidence, and Appendix. 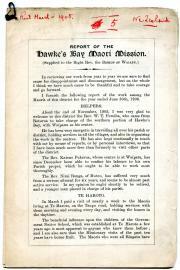 Ordered, by The House of Commons, to be Printed, 31 July 1890. Folio, xiv + 499. Stitched. In original blue printed wraps. Text clear and complete. Internally good, on aged high-acidity paper. Front wrap (with small paper label in top corner) detached, and spine chipped. Signatures on detached album leaf of Maurice d'Oisly, tenor, his NZ wife, Rosina Buckman, coloratura soprano, Léila Mégane, Welsh mezzo-soprano, Edmund Edwards [? ], [overleaf] Archibald G. Easley [?] and Dinh Gilly, French-Algerian operatic baritone. Maurice d'Oisly, tenor, Rosina Buckman, his NZ wife, coloratura soprano, and others. Page detached from Album, slightly aged, mainlty good condition; Yours very Sincerely | Rosina Buckman || With the best of good wishes | Maurice d'Oisly || Léila Mégane | 1921 || Edmund Edwards |. Overleaf: 'There's joy in remembrance | with all good wishes, | Archibald G. Easley. | 5/2/21. 1906 and 1907. All four items printed at the Daily Telegraph Office, Tennyson Street, Napier [New Zealand]. The four items are uniform, with leaf dimensions 21.5 x 14 cm. Three bifoliums and a 16-page pamphlet, totalling 27 pp of text. All unbound, and attached to one another by string in top inner corner. Text of all four items clear and complete. A little grubby, on aged and creased paper, with wear to extremities. Small blank scrap lacking from margin of first leaf of second item. 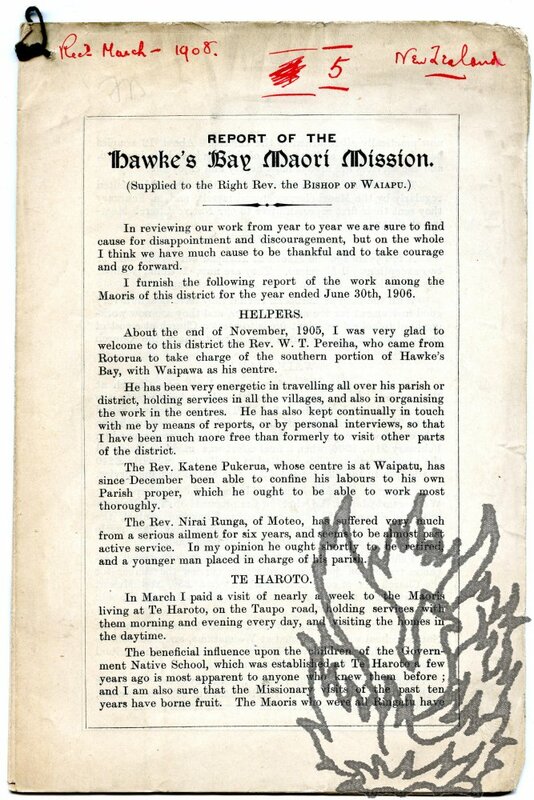 Item One: 'Report of the Hawke's Bay Maori Mission. (Supplied to the Right Rev. the Bishop of Waiapu.)' 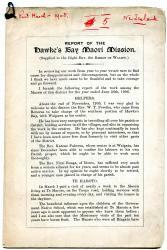 by 'Arthur F. Williams, Missionary in Charge, Te Aute, Hawke's Bay'. 4 pp. Under Southern Skies. 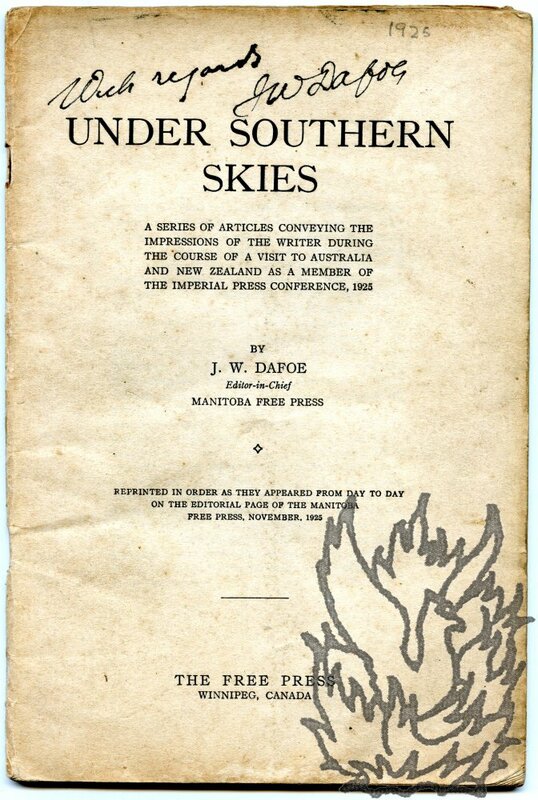 A series of articles conveying the impressions of the writer during the course of a visit to Australia and New Zealand as a member of the Imperial Press Conference, 1925. 8vo: [iv] + 43 pp. Stapled pamphlet. Inscribed at head of title 'With regards | J W Dafoe'. Text clear and complete. On grubby, aged paper, with wear to outer leaves. An introduction explains that of the seventeen articles, 'the first seven [...] are merely comments on certain aspects of the New Zealand scene as they appeared to a passer-by', while 'the ten articles devoted to Australia deal with the same subject from various angles. They constitute an attempt at a study of Australia's political developments in the social and economic field.' No copy in the British Library or on COPAC. Newspaper Cuttings (Guardbooks) of reviews of their much travelled act, cartoons and newspaper advertisements. MIlner & Storey (Dulcie Milner and George Storey), vaudeville artists. Two vols, hf-lea, one 4to the other 8vo, title "Newspaper Cuttings on front of one, "Cuttings" on spine of the other, boards bumped and bent but mainly good condition, 112pp. and pp, vast majority of items, some substantial and folded, laid down and with a neat statement of the newspaper source and the date. The Names "Milner & Storey" and "Dulcie Milner & George Storey" are written attractively at the beginning of the volumes. The record, charting the theatrical careers of the partnership in great detail, was obviously a labour of love (self-love?). Without date or place, but taken from George William Anderson's 'A new, authentic, and complete collection of voyages round the world [...] containing a new [...] account of Captain Cook's [...] voyages' (London: Alexander Hogg, ). Roughly nine and a half inches by fifteen wide. Mounted on a piece of card, with some fraying to extremities. Somewhat aged, but a good impression of a strong, striking idealised illustration, showing a bearded warrior with a club, emerging from the undergrowth beside a tree and fast-flowing water, beside which four women (one of them baring a breast) recline with their children. Articles of Constitution, Adopted at a Meeting held in London, 9th May, 1899. 12mo bifolium: 3 pp, with reverse of second leaf blank. Unbound. Good, on lightly aged and spotted paper. Names the officers on p.1, and gives the nine articles of consitution on pp.2 and 3. Small circular red stamp of the Webster Collection (no. 4156) in bottom right-hand corner of reverse of second leaf. No copy listed on COPAC. Typed Letter Signed ('Richard. O. Gross') to K. W. Luckhurst, Secretary, Royal Society of Arts. 20 June 1949; on his letterhead from 7 Marie Avenue, Hillsborough, Auckland, New Zealand. Autograph Note in the third person to autograph collector 'Mr. Barker'. 27 November 1908; 44 Grosvenor Gardens, London SW. [on embossed House of Lords letterhead]. Autographed Note Signed to unnamed correspondent. 30 May 1924; no place. 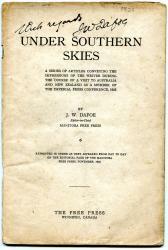 New Zealand-born English author (1884-1941), best know for his series of 'Herries Chronicles'. Paper dimensions roughly four and a half inches by five inches. Folded once (not affecting signature). Mounted on larger piece of cream paper. From Autograph album. Reads 'With the best | wishes of | Hugh Walpole | May 30th. | 1924'. Governor of New Zealand (1853-1911). Two pages, 4to. Grubby, foxed and discoloured, and with traces of archival tape adhering to second leaf. 'I am entirely at one with you in thinking that there is no reason in cottage building why one should sacrifice appearance and picturesqueness to mere cheapness. I went very carefully over your cottage, and [...] I thought it the most practical of all those that were exhibited, and it was for that reason that I wrote for what I thought was a treatise upon the subject. 18 Aug. 1886 and 28 Jan. 1890.